The Kinvara Rock & Road running race will take place in and around Kinvara on Saturday 2nd March 2019. While we are planning for the event to cause minimal disturbance, we have applied for some road closures that may affect you. The road closures are to ensure the safety of the runners in the events. There will be three races on the day. One is over a 10k (10 kilometre) distance, one will be over a Half Marathon (13.1 miles) distance, and the third is a Full Marathon (26.2 miles). Click here for race routes: 10k, Half Marathon, Full Marathon. The affected roads will be closed from 10:30am until 3:00pm on Saturday 2nd March. During this time, there will be no vehicular access on the roads affected. However, as per the application to Galway CoCo emergency access and egress is maintained at all times, with pedestrian access unaffected. While the roads are scheduled to be closed for the duration, roads will re-open once the race has passed. In the interest of safety we ask that you be mindful of the event and would appreciate your cooperation in taking due care between the hours of 10:30am and 3:00pm. Note also that full marathon participants will be on the race route from 10am. Race marshalls will be positioned at key points along the route to manage the race, promote safety and provide you with information on the race. The main race area will be at the quay in Kinvara with the 10K starting at 12:00pm and the half marathon at 12:10pm (the walkers in the half marathon will start at 11:00am). The full marathon starts at 10:00am a short distance outside the village. All races finish at the quay. You are very welcome to come and join us at the quay and to encourage the athletes. Access roads to the pier will be closed on 2nd March from 10:30am until 3:00pm. This will include the Pier Road from the N67 (at the corner of Connolly’s) all the way to the other end of that road at Nun’s Orchard. The Courthouse Road will also be closed. This area will re-open at 3:00pm. – for closures A and B use the adjacent N67. – for closures C and D westbound traffic should remain on the N67 and take a left onto the L4507 (eastbound traffic, vice versa). 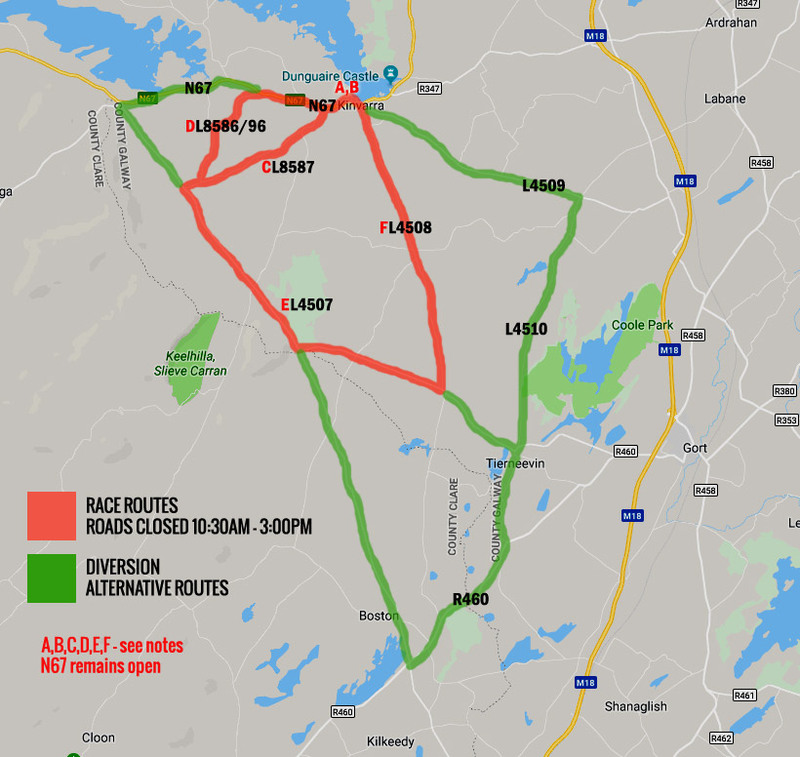 – for closure E eastbound traffic at Leagh should remain on the N67 to Kinvara, take a right onto the Gort road to Cahermore cross (L4509), a right onto the Tiernevin road to Kilmacduagh (L4510), a right onto the R460 and right onto the L4507 at Lough Bunny (westbound traffic, vice versa). – for closure F southbound traffic should use the Gort road to Cahermore cross (L4509), a right to Tiernevin (L4510) and right onto the L4507 to Rockpark (northbound, vice versa). All road closures are in effect from 10:30am until 3:00pm. However, as the last runner passes various points along the routes the roads will re-open behind them. You can then travel on these roads in the opposite direction to the runners only. The three routes overlap for the final 2.8 miles. The re-opening time for this section will be determined by the last entrant in the half or full marathon. It is unlikely that this section will re-open much before 3pm. For more information on road closures affecting residents phone 087 9758056. This number is not for general race queries. Please see the FAQs page, Race Info section or email info@rockandroad.ie. In the case of an emergency please follow standard emergency procedures. Emergency vehicles will have access at all times. If a resident needs access or egress in an emergency situation please contact the liaison officer Eoin Ryan of The Bungalow, Lynders Farm, Portrane Road, Donabate, Co. Dublin on 087 9758056 or alternatively Andrew Deakin on 087 6667015. These numbers are not for general race queries. Please see the FAQs page, Race Info section or email info@rockandroad.ie. If a resident has a concern that they wish to lodge, please forward your concern in writing accompanied by a return address and contact phone number to Dolmen Sports, Moy Road, Kinvara, Co. Galway and it shall be responded to within 10 working days.